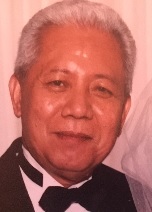 BENJAMIN LAGUNZAD TUPAZ, age 84. Beloved husband of Alicia Tupaz (nee Anloague). Dear father of Audrey Godoy (Joe), Brian Tupaz (Vic) and Brando Tupaz (Dawn). Grandfather of Hayley, Gabriel and Joshua Tupaz, and Jared, Jasmine and Justin Godoy. Brother of Lucy Labadia, Lourdes Rushwin, Gloria Beringuel, Florencio Tupaz Jr., Emma Dispo, and the late Remedios Sano, Trinidad Chan and Lilia Magno. Funeral Mass Monday March 25, 2019 10:00 am at Holy Family Church, Parma. Interment Holy Cross Cemetery. Friends may call at the SCHUSTER STRAKER O'CONNOR FUNERAL HOME 5904 Ridge Road Parma Sunday March 24, 2019 from 5:00 - 9:00 pm.